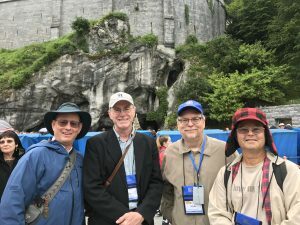 We spent the whole day touring the Lourdes Shrine with a special meeting with the doctor in charge of all the decisions regarding accredited and official healings. We had Mass at the Grotto of Bernadette at which an Irish priest gave an excellent homily (here). After a free afternoon, which many used to go for prayer, confession, rest, shopping or the baths, we ended with the magnificent demonstration of the universality of the Catholic Church in the Rosary Procession. But the Rosary Prossession will be in Part 2 added soon.